Established in 1996, World Wide Art specializes in limited editions, originals and sculptures created by today’s top animation artists from studios like Disney, Warner Brothers, Hanna-Barbera and Pixar. 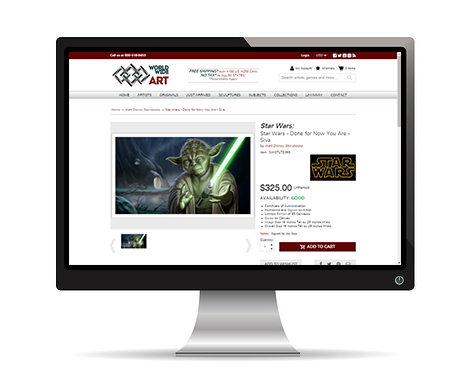 Built on the robust Magento eCommerce platform, World Wide Art has expanded their reach beyond their Art Gallery and Custom Framing shop in Castro Valley, CA. World Wide Art came to InteractOne with a new Magento website that had not been properly migrated or configured. When the site was migrated to Magento, content was not transferred from their old platform. After the migration, they were experiencing issues with SERPs (Search Engine Result Pages) as well as redirect issues resulting in a large amount of 404 Not Found errors. This caused a significant decline in organic traffic leading to a significant decline in conversions and revenue as well. World Wide Art tasked InteractOne with properly configuring the new site to meet SEO best practices and to correct any other issues that had accumulated as a result of the migration. InteractOne began by evaluating and diagnosing the aspects of the website that needed immediate attention. We created an action plan to address site crawlability, search engine indexation, extension conflicts, site performance and success tracking. We updated the index.txt file with the proper rules for better site crawlability. This made the site easier to navigate and more visible on SERPs. To address the 404 errors and search engine indexation issues, we utilized Google Search Console, Google Analytics, and old sitemaps, to gather the lost URLs to create proper 301 redirects. With the the proper 301 redirects in place, onsite user metrics improved including bounce rate, time on site and pages per visit. To further improve site performance, we fixed extension conflicts that were causing broken on-site links. We also updated their Google Analytics account and created eCommerce conversion goals so World Wide Art can track and monitor their success over time. World Wide Art saw improvement across the board with the successful and ongoing implementations of our action plan. Search engine indexation, time on site and reduced site crawl errors in Google Search Console saw improvement as well. 404 errors have improved and are a part of our ongoing solution. With an updated Google Analytics account, World Wide Art is now tracking and monitoring conversion goals and going forward will be able to monitor revenue over time. If you are interested in learning more about how InteractOne can help you build your brand, break into eCommerce, or market to your targeted audience, contact us or give us a call 513-469-3345.